Stoke Newington Church Street is a road in north London of the borough of Hackney. The road links Green Lanes (A105) in the west to Stoke Newington High Street (the A10, formerly Ermine Street), in the east. Stoke Newington is one of the villages swallowed by the growth of London in the 19th century, and Church Street retains some of this neighbourhood feel, with many restaurants, pubs, and independent (non-chain) shops. Clissold Park marks one end of Church Street. Near to it, at the junction with Albion Road, is the municipal town hall and assembly hall of the old Borough of Stoke Newington, refurbished during 2009-10. Abney Park Cemetery, set up as a non-conformist cemetery and arboretum in 1840 on the site of parkland of the same name and now run as a nature reserve, has an entrance on the street. This is next to the fire station, which was built on the site of Fleetwood House and Abney House, where Newington Academy for Girls, an innovative Quaker girls' school, ran from 1824. It commissioned the World's first school bus, which ran from Church Street to Gracechurch Street meeting house in the City, taking the pupils to worship. There are two churches on the street, both known as Saint Mary’s. (See Stoke Newington (parish).) The first was built in 1563 and was partially rebuilt in the 19th century and then again in the 1950s after heavy bomb damage during World War II. The second church is the impressive mid-Victorian Saint Mary's New Church with its 250-foot steeple. 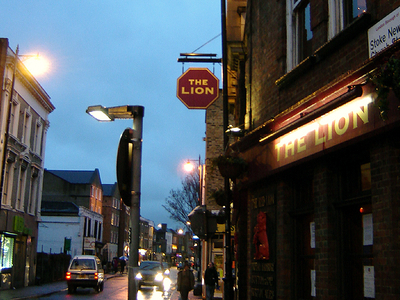 The street has become famous for its large number of public houses and restaurants providing a wide range of food, drink and entertainment. There are a number of licensed venues serving alcohol and hosting live music. For entertainment Ryan’s Bar and the Auld Shillelagh have live music licences. The Daniel Defoe pub (named after the author of Robinson Crusoe, who lived nearby) offers a good range in real ales and has a passable beer garden. For dining, the two Rasa restaurants offer Kerala cuisine (Rasa Travancore not being vegetarian), Il Bacio and Il Bacio Express specialise in Italian cuisine. Other popular places include the Spence bakers for a good range of breads. In addition to public houses and restaurants, the street is also home to a wide range of independent shops and boutiques offering unusual craft items, jewellery, and clothes. Here's the our members favorite photos of "Famous Streets near London Borough of Hackney". Upload your photo of Stoke Newington Church Street!